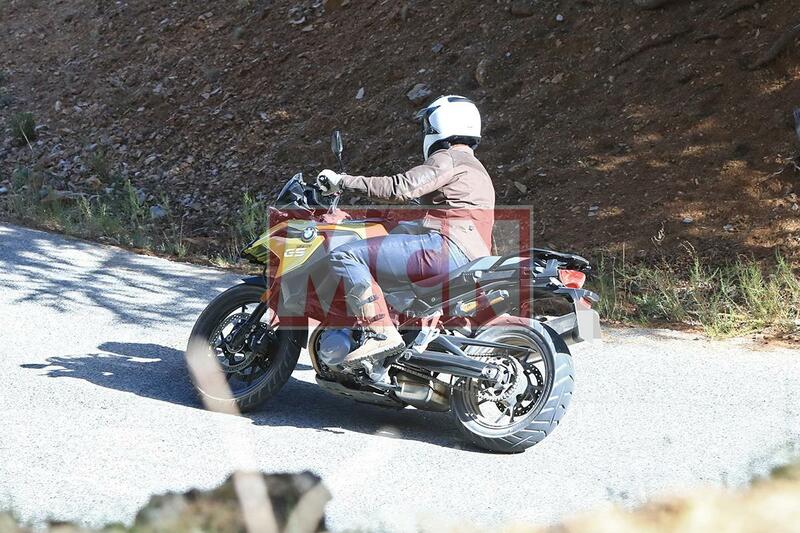 A few months ago we saw spy shots of a new BMW F850GS, swiftly followed by others of a new 750, too. And now our spy snappers have captured undisguised bikes on location. The two bikes have always stood together (the F700 has a detuned 800cc engine from the F800) and it appears this formula has continued – in fact, just like the F850GS we saw, almost nothing of the original bike remains. The most obvious change is the engine – a detuned version of the one we’ve seen in the upcoming F850GS. With the small increase in capacity, we’d expect the power to push up to around 85hp, which is a healthy increase and should deliver much-needed extra pep. As part of these changes, the drive side and exhaust side have swapped, and BMW have redesigned the exhaust, so the collector box is much larger under the bottom of the bike, while the end can is considerably slimmer. One bike in the photos is fitted with a titanium HP sport exhaust, which will be an aftermarket accessory and may well bring a few extra horses along with it. As well as the engine, there are big changes in the frame. The steel trellis is gone in favour of a cast aluminium frame, also seen on the F850GS. The subframe has been redesigned and now includes mounting points for BMW panniers, which is an improvement over the previous steel pannier frames. 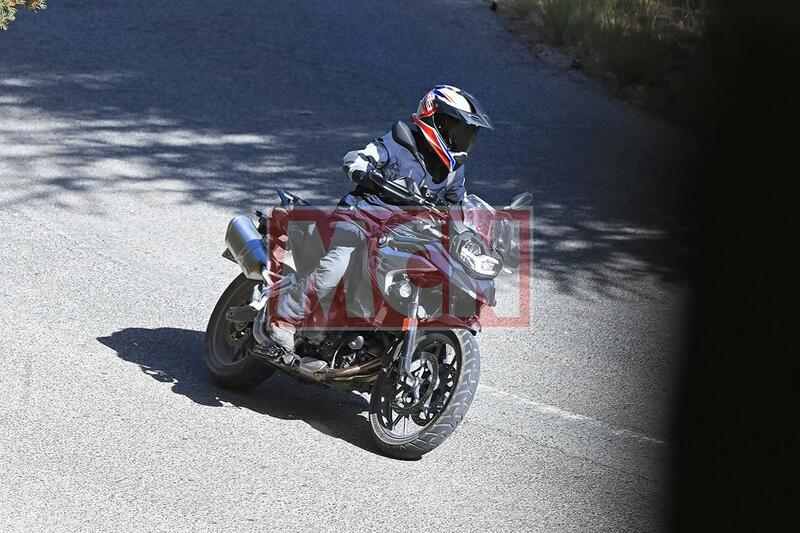 The new model is much more aggressive looking with sharper lines and edges compared to the current F800GS. But there are clear cost-saving measures, such as the cast wheels, non-radial brakes and non-adjustable forks. What is also clear from these pictures is that there are three distinct models, with steadily increasingly levels of spec, although they all share the same big bits (engine, frame, wheels, fork etc). There is a base model, a mid-range one we expect to be called the Exclusive and a top of the range Triple Black. While the base model makes do with a standard shock, the Exclusive and Triple Black are both fitted with BMW’s latest Dynamic ESA. Unlike traditional electronic suspension, where riders choose between settings, ESA is semi-active, so it adjusts the damping as you ride. It is also adjusts itself according to which power mode the bike is in, so we’re assuming the Exclusive and Triple Black models will have three power modes rather than the standard two: Road, Rain and Dynamic. All of these settings will be adjustable on the road, using the new handlebar controls and visible on the new full-colour TFT dash fitted to the Exclusive and Triple Black. Neither the control wheel or the dash are new, the control wheel has been around for years and the dash is a new option on the premium models, but they’re new to these entry-level bikes. It also shows a higher level of integration that wasn’t available previously – one model has a BMW Navigator satnav fitted, too, which can be operated by the control wheel. The base model also gets a new dash with a traditional analogue rev counter and digital speedo. All the models have a can-bus power socket. Both the Exclusive and Triple Black get LED lights all round while the standard model sticks with conventional bulbs. The Triple Black also has a set of fog-lights, handguards and a centre-stand, while all the parts will be available as options for each model. We’re expecting the F750GS to be unveiled alongside the F850GS at the EICMA motorcycle show in November and to arrive in dealers early 2018. We’d expect the price to creep up past the current F700GS’s £8000 starting point.